Harlem Globetrotters Fan Powered World Tour Review by Rebecca Parks | A GREAT Time was had by all at The Harlem Globetrotters Game! Use Promo code FUNFAM! We had such a fantastic time at the game. The youngest truly enjoyed all the fun and antics, and participation from the crowd. 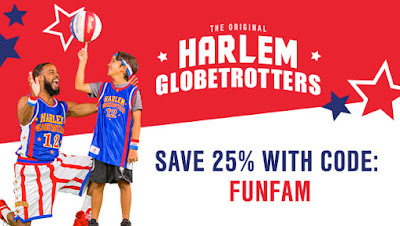 The Globetrotters really get the families involved, dancing, shooting baskets etc. There was even an opposing team of villains which kept things interesting. This is Flips. He was literally sitting on the hoop, and flipped down after he was finished entertaining us all. 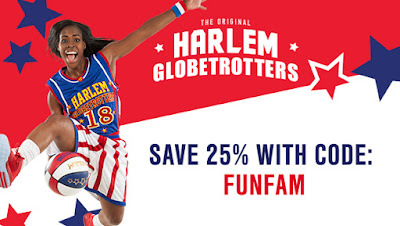 You can enjoy The Harlem globetrotters in your city too. Just head to the site and DON'T FORGET to us the promo code FUNFAM! You can save 25% on ALL games! The Harlem Globetrotters do not disappoint! I always enjoyed the Globetrotters when I was younger. I always had a great time, and now have the opportunity to let my family join in on the FUN! You can have FUN too! I will be enjoying a star-studded roster consisting of Big Easy Lofton, Ant Atkinson, Hi-Lite Bruton, Thunder Law, Bull Bullard and Cheese Chisholm- plus amazing female stars TNT Lister, Ace Jackson and Hoops Green! The Harlem Globetrotter's Show is unrivaled in the world of family entertainment. The 2018 World Tour will show just how amazing their ball handling wizardry, rim-rattling dunks, and hilarious comedy can truly be. After the game, The Globetrotters will sign some autographs, and take some photos with their fans. Can't wait to join in the FUN!